If the idea of giant robots punching giant Godzilla-like monsters in the face doesn’t entice you even a bit, then we can’t be friends. Go ahead and stop reading this article now. Remove me from your friends list or Twitter feed, and may God have mercy on your poor, sad soul. 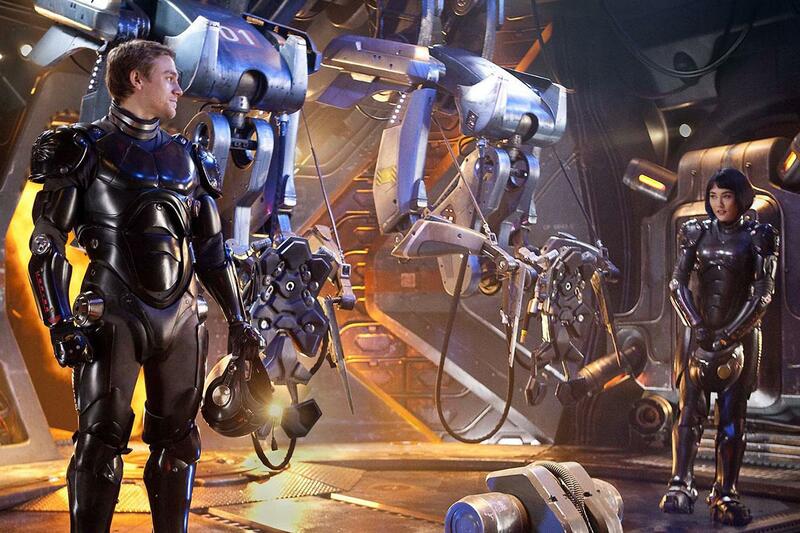 Pacific Rim is not a “smart” movie. It won’t make you cry, nor will it make you wonder about the meaning of life. You won’t leave the theater and tearfully call your loved ones with a heightened awareness of your own mortality. No, Pacific Rim is about giant robots and monsters. It’s like someone gave a really talented 14-year-old boy a camera and a huge budget, and I mean that in the best way. Going into the movie, I joked that I would be disappointed if there wasn’t a massive robot battle within 10 minutes, I was walking out. I think it was probably closer to five minutes before the first robot appeared. From that moment on I relaxed, fully aware of the type of movie I was in for. Everything you see is rich with depth and color, from the rusted base of operation to the ruins of Tokyo. 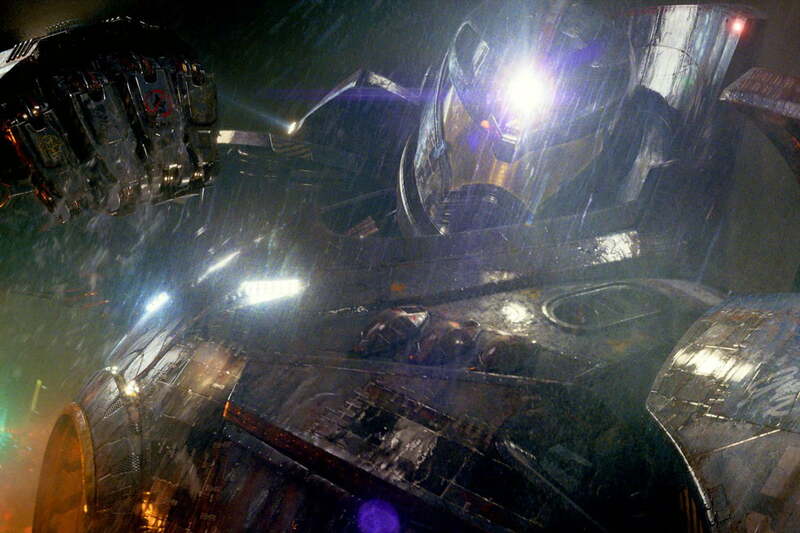 Director Guillermo del Toro is an obvious anime fan, but you don’t have to be to appreciate Pacific Rim. All you really need to know are the story basics: A rift to another universe opens in the Pacific Ocean, and monstrous Kaiju (colloquial Japanese for “giant monsters”) of increasing strength have been pouring out for years. The governments of the world join forces to combat the new menace, and the “Jaeger” robots are born. The setup is handled quickly and efficiently, and a short montage accompanied by a voice over summarizes the world by the year 2020. If you do happen to be an anime fan, the movie will resonate on a very personal level. There have already been plenty of comparisons between Pacific Rim and Neon Genesis Evangelion. 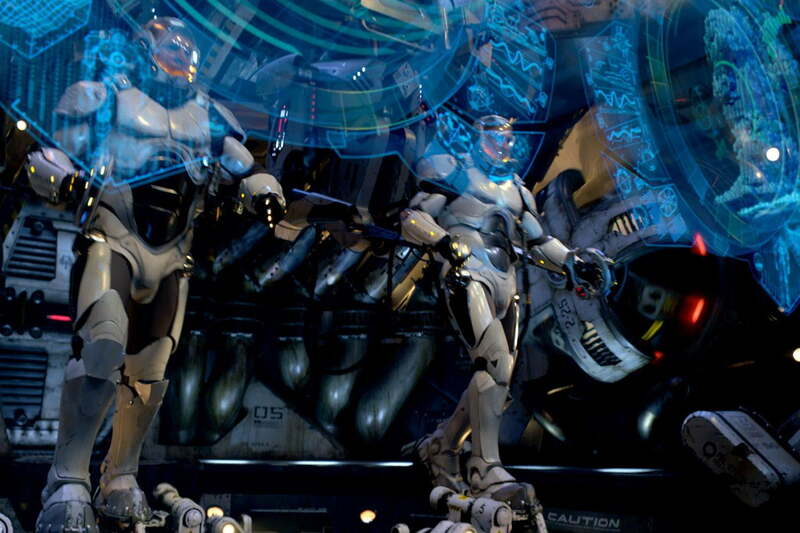 Both feature giant mechs controlled by humans, both feature increasingly powerful Kaiju. You could also just as easily draw parallels to Gundam, Code Geass, Big O, or dozens of others. Just don’t confuse similar setups with similar stories. Where Evangelion developed into a story involving deep religious themes and psychology, Pacific Rim has giant robots with rocket-powered elbow punches. The story is more universal than any one anime tale, and it is easily accessible to everyone. 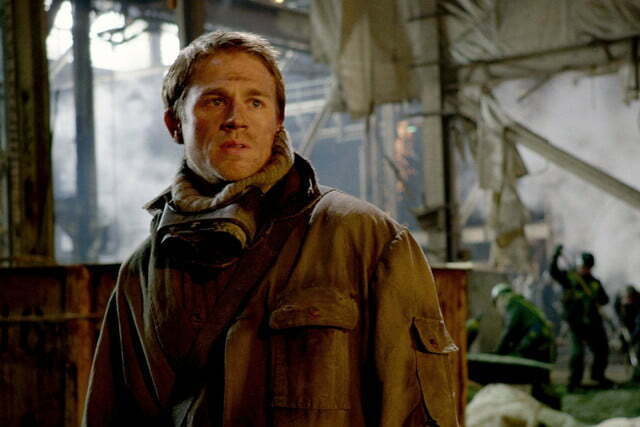 The conflict between the Kaiju and humanity is the driving force of the film, but its heart rests with former Jaeger pilot, Raleigh Becket (Charlie Hunnam). 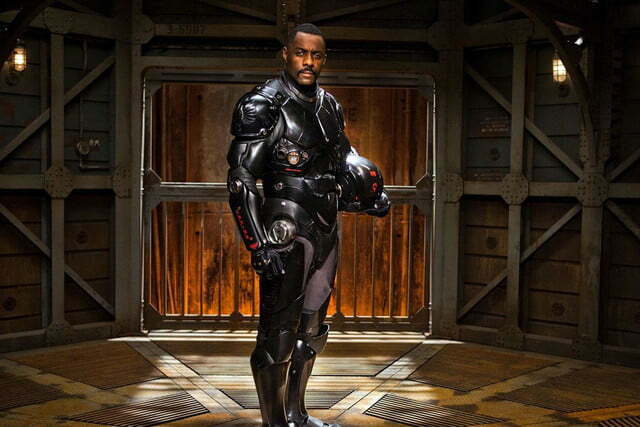 Years after leaving the program behind, he is brought back into the fold by the Jaegers’ commanding officer, Stacker Pentecost (Idris Elba), to help mount what is fast becoming the last stand of humanity. The Jaegers are too much for any one human to control, instead requiring two pilots to “drift” together, linking their minds and memories to function as one. This nuanced concept could have easily derailed a movie that shouldn’t ask you to think, but thankfully it doesn’t. It’s used more to highlight the difficulties that Raleigh’s new partner, Mako Mori (Rinko Kikuchi) has in piloting a Jaeger. If Becket is the film’s heart, Mori is its soul. The rest of the characters in the cast are generally in it only for brief flashes, but they make the most of it. Charlie Day and Burn Gorman offer a touch of eccentric comic relief as scientists working on the Kaiju problem, while Ron Perlman’s Hannibal Chau is underutilized, but does a lot with what he is given. 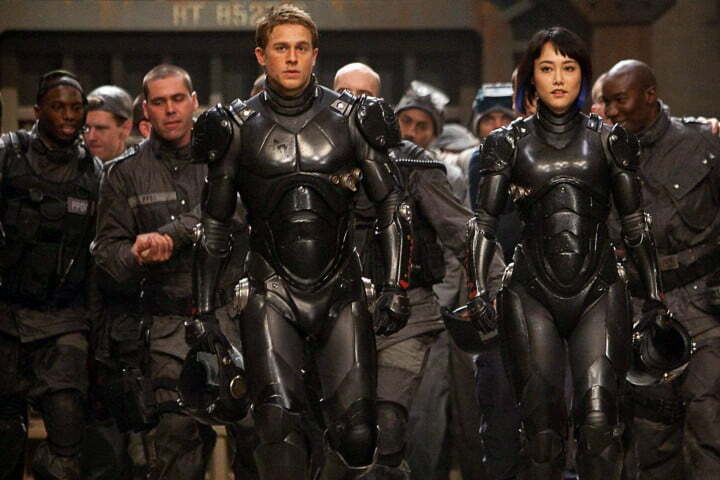 Charlie Hunnam and Rinko Kikuchi play Jaeger pilots, controlling the giants mechs as a team. There are a few moments between fights when the film drags, but they are over soon enough, and the cast typically is likable enough to carry the story through the slow parts – especially Hunnam and Elba, who both excel with fairly stereotypical characters. The story and even the acting is all secondary, though. 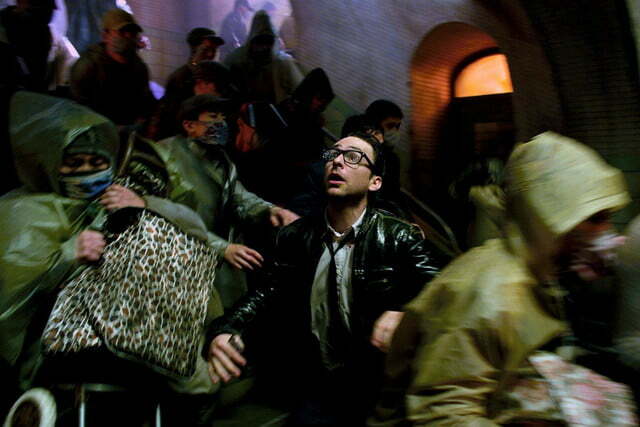 No one in the world will go see Pacific Rim because they are interested in Charlie Day’s character arc. They will go for the spectacle, and they won’t be disappointed. Del Toro chooses every shot with care, and nothing is left to waste. Everything you see is rich with depth and color, from the rusted base of operation to the ruins of Tokyo. There are no simple backgrounds. Even the scenes featuring the ocean are teeming with detail and color. Despite a flurry of activity in every shot, it rarely feels confusing to watch (with a few minor exceptions). The music doesn’t fair quite as well, but it is more forgettable than bad. There are plenty of moments that are just so ridiculously over the top that they are awesome, and should leave you with a smile on your face. Pacific Rim is an unabashed action movie built on spectacle with an epic scale. The story is serviceable, and the cast makes the most of what it is given, more than enough to keep you invested until the next big set piece. Don’t go in expecting a lot of depth and you won’t be disappointed. Instead you may find the best popcorn movie of the summer.